Many of the emails we receive are questions about oil running out of the small 3/16 diameter hole on the starboard side of the lower housing on Pre-Alpha and Alpha drives made from 1974 - 1990. There should never be any oil coming out of this hole. It is a drain hole for lake water only. Before 1974 they did not have this hole. 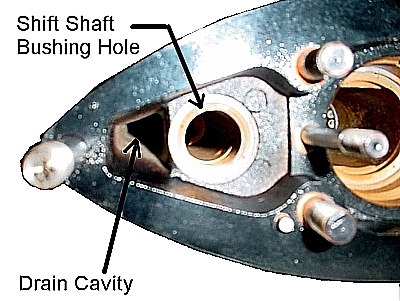 It can be added to older drives to flush away sand from the cavity in front of the shift shaft bushing hole in the lower housing ( shown below ). When the boat is on a trailer and the engine is hooked up to a garden hose and running, a good stream of water should be shooting out of this hole. If it is not, you can try to run a piece of wire thru the hole to loosen up sand and stones which get lodged in the drain cavity inside. 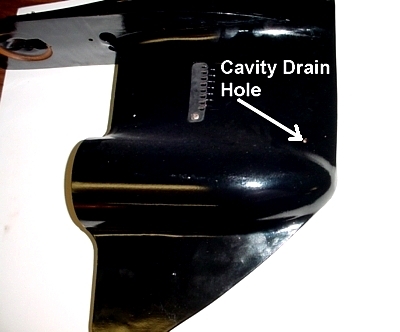 The most common cause of oil dripping out of this hole is listed below in order of importance. Units made before 1978 had a steel shift shaft in the lower housing. These shafts rust badly and let water in and oil out. This must be replaced with a stainless steel shift shaft. The oil seal in the shift shaft bushing assembly is shot. The shift shaft bushing assembly should be replaced. The 2 seals in the water pump lower base are bad. The lower water pump base should be replaced. The 2 seals located in the upper housing are bad and letting oil run down the vertical drive shaft and into the drain cavity. The upper housing should be completely resealed. Click here for instructions on replacing lower shift shaft, lower shift shaft bushing assembly or water pump lower base. Click here for basic tool list.